North Berwick Golf Lodge is a former coaching House situated in the heart of East Lothian on the beautiful East of Scotland coastline which now offers exclusive luxury self catering golf accommodation to the highest standard. Edinburgh, Scotland's historic Capital is only 20 miles away and is easily accessible by road or train. North Berwick Golf Lodge offers luxury accommodation for the golfer or family group who yearn the privacy and exclusive use of the facilities whilst enjoying the comforts of a 5 star Hotel. When you are visiting East Lothian for a golfing holiday with friends, a family gathering or a small business get together, North Berwick Golf Lodge will offer you the freedom and comforts of a private home. Located on Fidra Road, North Berwick Golf Lodge is the ideal base for golfers wishing to sample some of Scotland's finest Links Golf courses. North Berwick West Links is a 5 minute walk from the lodge & Muirfield - host to the British open Championship- is only a five minute drive away. Indeed the choice is endless with some further 20 courses situated within 20 minutes drive of the lodge including Gullane, Dunbar, Luffness & Archerfield. 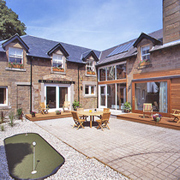 North Berwick Lodge provides a truly superb location for families. It is only a few minutes’ walk from the beach and the town centre and nearby places of interest include The Scottish Seabird Centre, The Museum of Flight and the Glenkinchie Whisky Distillery as well as various Castles and Stately homes. Edinburgh, Scotland's Capital is only 20 miles away and is easily accessible by road or train. Hosts Tom & Emma Hill live close by and can offer clients' additional services to include served full breakfast, daily housekeeping, laundry and food and beverage requirements from snacks with cold beers to formal dinner with fine wines. A full concierge service is offered including golf and restaurant reservations. North Berwick Golf Lodge also offer an executive golf travel service with our chauffeur driven Mercedes Traveliner. Guests can also enjoy leisure and Spa facilities at the nearby Macdonald Marine Hotel and Spa with our compliments, situated only 3 minutes walk away. North Berwick Golf Lodge...... A warm welcome awaits & Scottish hospitality prevails. We look forward to welcoming you.